A modern day prince and princess are getting married in Bengaluru this weekend. We look at their families and their fascinating connections to each other. Mumbai Mirror alerted us to the Big Royal Shaadi in Bengaluru this weekend. The groom is Akshay Bhansali, a producer for MTV New York. The bride is Krutika Raje Ghorpade. Akshay will be 38 on September 19. 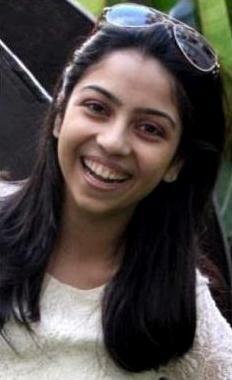 Krutika will be 28 on October 19. Akshay's father is Dr Siddharth Bhansali, a Lokmanya Tilak Medical College, Mumbai-trained cardiologist and a long time resident of Louisiana, the state where Bobby Jindal was a two time governor. 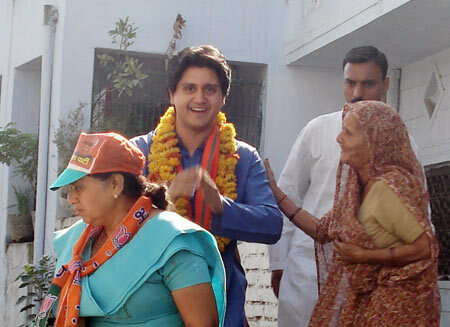 His mother is Yashodara Raje, commerce minister in Shivraj Chauhan's government, and Maharaj Jivajirao Scindia and Vijaya Raje Scindia of Gwalior's youngest child. We are not sure where the princess and the doc met, but we hear her family was not pleased that her husband was not a blue blood aristocrat. Yashodhara Raje was the only one among her five siblings to marry a commoner. The Bhansalis have three children -- Akshay has a younger brother Abhishek and a sister Trishala. After her marriage ended, Yashodhara Raje returned home to Gwalior, where her mother, the Rajmata, formidable doyen of the Bharatiya Janata Party, reportedly encouraged her to enter politics instead of moping in the palace. Yasho -- as the family calls her -- has been elected thrice to the Madhya Pradesh legislature -- in 1998, 2003 and 2013. In 2009, she was elected to the Lok Sabha from the Gwalior. Akshay, as we noted on these pages back in 2009, has been at his mother's side during her election campaigns. His bride to be, Krutika, is the daughter of Kartikeya Raje Ghorpade of the Sandur royal family in Karnataka. Her grandfather Murarirao Yeshwantrao -- M Y to all -- Ghorpade was a prince, a politician and above all a photographer of rare distinction (external link). A seven time Congress MLA from Sandur -- and once a MP from Raichur -- M Y is said to have given Panchayati Raj in Karnataka a remarkably new direction when he served as the state's Panchayati Raj minister. Imagine the irony, a prince and Panchayati Raj! M Y was an unusual man. A post graduate in economics from Cambridge -- aristocrats and academics rarely intersect -- he was a tireless chronicler of wildlife and his photographs are truly amazing (external link). Krutika's mother Ambika Raje is from the royal family of Baroda. As is her paternal grandmother. M Y's wife Vasundhara Raje was the daugher of Maharaja Pratapsinh Gaekwad. Ambika Raje's father Prabhatsinh Gaekwad was an unusual aristocrat, someone who entered the IAS in 1956 and served as Gujarat chief secretary, apart from several important posts. Prabhatsinh Gaekwad's first cousin and nephew, incidentally, both played cricket for India. Dattaji Gaekwad, now India's oldest Test cricketer, played 11 Tests and captained India on the 1959 tour of England. His son Anshuman Gaekwad played 40 Tests and was called The Great Wall for his defensive style of play. Cricket fans, now in their fifties and older, will always remember Anshuman Gaekwad standing up to the fearsome West Indian bowling attack in a 1976 Test in Jamaica, refusing to flinch despite taking several blows on his body. The Gaekwads of Baroda, of course, have an old connection with the Scindias. Indira Devi, Maharaja Sayajirao's beautiful, fiercely independent and only daughter, was engaged to marry Madho Rao Scindia, Yashodhara Raje's grandfather. At the 1911 Delhi Durbar, where India's maharajas, maharanis and their children flocked to meet King George V and Queen Mary, the emperor and empress of India, Indira Devi met and fell in love with Jitendra of the royal family of Cooch Behar. Daringly for that age, Indira Devi broke the engagement to Madho Rao Scindia herself, her decision causing Maharaja Sayajirao of Baroda much distress. Her parents did everything to stop Indira Devi's wedding to Jitendra Cooch Behar, but eventually gave in. Among Indira Devi's five children was Gayatri Devi, who grew up to be 'the most beautiful woman in the world,' the elegant maharani of Jaipur and for many years the politician with the highest winning margin in an election anywhere on the planet. One of Indira Devi's grandsons, Bharat Dev Burman of the royal family of Tripura, is Trinamool Congress MP and actress Moon Moon Sen's husband and actresses Raima Sena and Riya Sen's dad. He is also the legendary actress Suchitra Sen's son-in-law. Almost a century later, a Gaekwad princess did marry a Scindia. Priyadarshini Raje, Maharajkumar Sangramsinh Gaekwad's daughter and Indira Devi's great grand niece, married Jyotiraditya Scindia, Madho Rao Scindia's great grandson. Baroda is not the only connection Priyadarshini and Jyotiraditya -- the current Maharaja of Gwalior and the articulate Congress MP -- have. Madhavi Raje, Jyotiraditya's formidable mum, is the daughter of General Yuvraj Shamsher Jang Bahadur Rana of Nepal, while Asha Raje, Priyadarshini's elegant mother, is General Arjun Shumsher Jung Bahadur Rana's daughter. Priyadarshini's brother Pratapsinh Gaekwad married the daughter of another Nepalese general, Pyar Jung Thapa. Of course, the best known Nepali connection to the Scindias is Devyani Rana, Akshay Bhansali and Jyotiraditya's first cousin. Devyani's mother Usha Raje is Rajmata Scindia's second child; her dad Pashupati Shamsher Jang Bahadur Rana is a Nepalese politician. Nepal's Crown Prince Dipendra fell in love with Devyani and wanted to marry her, but when his mother Queen Aishwarya nixed the match, Dipendra, in a murderous rage, killed his father King Birendra, mother, brother and sister on June 1, 2001. Nearly six years later, Devyani married Kunwar Aishwarya Singh of Singrauli, whose mother Veena Singh is the late Congress politician Arjun Singh's daughter. Ironic really, given that Devyani's uncle Madhavrao Scindia and Arjun Singh were bitter rivals in Madhya Pradesh politics. Chitrangadha Singh, Jyotiraditya's sister, is married to Vikramaditya Singh whose father Dr Karan Singh is, of course, the last Yuvraj of Kashmir; his mother Yasho Rajo Lakshmi is also a Nepalese general (Sharada Shumsher Jung Bahadur Rana)'s daughter. Mriganka Singh, Chitrangadha Singh's daughter, will marry Nirvan Singh, who currently runs his grandfather Captain Amarinder Singh's social media outreach in Punjab, and is usually at his side during the 2017 election campaign. Angad Singh, Nirvan's elder brother, married Aparajita Kumari -- whose father Virbhadra Singh is Himachal Pradesh's chief minister -- in March 2015. Like it has been through the ages, India's royalty has always woven a rich tapestry of alliances through marriages. Politics is incidental. If Jyotiraditya is in the Congress party, his aunts Vasundhara Raje, Rajasthan's chief minister, and Yashodhra Raje are in the BJP as was his grandmother, Rajmata Vijaya Raje. Jyotiraditya's cousin Dushyant Singh, Vasundhara Raje's son, is, like him, a member of the Lok Sabha, elected from Dholpur where his father is the maharaja. Jyotiraditya's sister Chitrangadha's father-in-law Dr Karan Singh -- whose father Maharaja Hari Singh signed Kashmir's Treaty of Accession with India -- is a Congressman, her husband Vikramditya Singh is aligned with Mehbooba Mufti's PDP in Jammu and her brother-in-law Ajatshatru Singh is a BJP MLC in Kashmir.